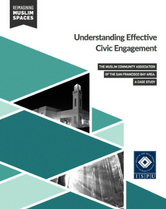 This second report in ISPU’s “Reimagining Muslim Spaces” series presents a case study of the Muslim Community Association (MCA) located in Santa Clara, California, one of the largest mosques in the United States. Established in 1981, MCA has consistently led efforts to promote civic engagement in the American Muslim community. MCA, on its own or in partnership with organizations such as the Council on American-Islamic Relations (CAIR), regularly hosts events and activities focused on involving Muslims in the civic life of America, including sponsoring candidate forums and educational programs to inform the Muslim community of their rights and responsibilities as active American citizens.